This article was written by Laura Markus with contributions made by Aimee Hicks, Bradley Adams, Jamie Coudeville, and Marine Perot. Edited by DJRiter. It has become intrinsically known to the public that acting requires slathers of skill to perfect. Certain meaty roles allow for actors to wholeheartedly transform themselves with an arsenal of traits and characteristics that they don't normally get to portray. This was certainly the case for Justina Machado, who was very accustomed to playing maids and housewives with very little screen time and not much of an opportunity to truly showcase the best of her talents. All of this changed when she got the role of matriarch Penelope Alvarez on Netflix's One Day at a Time. Season One introduced viewers to a truly badass mom, a former medic in the army, who returned home after an injury to raise her two fantastic kids. She deals with a variety of hardships on a day-to-day basis, but at the end of the day, she's a strong, passionate woman with so much love in her heart. She only wants the best for her entire family, including her mami, Lydia (Rita Moreno). Season Two might've been the season of Penelope. It was definitely Machado's best work on full force here, and no other outing best represented what Machado was capable of than episode nine Hello, Penelope. In this episode, Machado proved that she could embody the heart and soul of the show when it was thought so many other characters were already filling in that role. Her portrayal of mental illness in this episode was like no other show has done before, and could now be the precedent for how it must be shown in the future. Machado's outstanding work here has resulted in her being named SpoilerTV's Staff Choice Performer of the month for January. 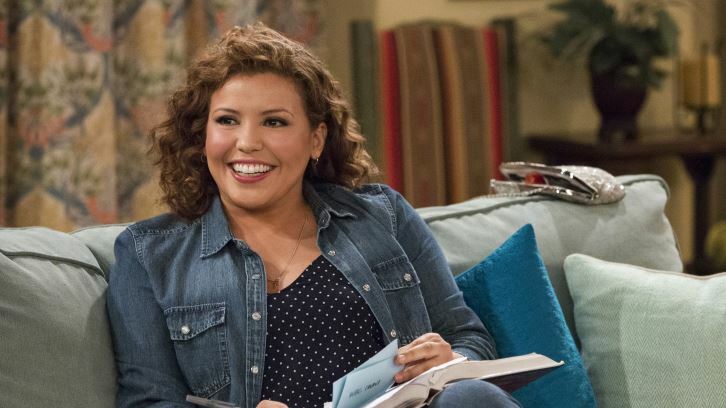 There are not a lot of group therapy scenes in the second season of One Day at a Time, but for an episode like Hello, Penelope, it is where the core concept of the story takes off. It all starts with Jill (Haneefah Wood) sharing with the group a story about something she recently experienced. All the while several women are talking, Penelope is all smiles and giggles. Justina Machado shows just how comfortable Penelope has become with group therapy and how much she enjoys being with the other women there. When the therapist suggests to the group to record themselves to help address issues, Penelope laughs, Machado's face conveying her perplexity towards the idea of talking to herself that way. "Hello Penelope, it's me Penelope," sounds like a stupid idea for her. But after the others are done talking about their troubles, Penelope is asked by the therapist to share. There, Machado glows even more because everything is fantastic in Penelope's life. She makes jokes about not needing the tools she gained in group therapy anymore because her personal life and her career are going great. Machado is luminous in this scene but almost seems like she overplays Penelope's happiness in order to show that if Penelope may be convinced that everything is perfect in her life, it's not quite as great as she may think. She beams as she talks about Max and stops babbling when she realizes that her blatant happiness might be bothering Ramona (Judy Reyes). Through Machado's joyful performance, Penelope appears to be at a very high point in her life in this scene. In contrast, her performance in the rest of the episode shows how much Penelope was wrong. She isn't fine, in fact, she is on the verge of distress. There is a fleeting glimpse behind the veil when Penelope believes she messed up her presentation at school. It doesn't matter that Elena (Isabella Gomez), Alex (Marcel Ruiz), and Lydia were adamant in trying to convince her that she rocked it. Even Sister Barbara laughing (something it’s revealed she doesn’t do very often) doesn’t help. None of this could matter to someone with depression and anxiety. Everything could be going right for them in stunning ways, but their brains do not let them relish in it, as will be touched on later in this article. Consuming caffeine later in the day only exacerbates Penelope's issues, so too does her decision to skip getting ice cream with her family in lieu of running home by herself. Machado conveys a woman dealing with inner turmoil so well. Her family is beaming with excitement and pride at what she has done but Penelope simply cannot agree. Machado excels to show Penelope's concern, making us bite our nails with nervousness. The scene where Penelope lashes out at Schneider is an important one. It’s the moment right before she crashes. Penelope is on her last bit of energy, she’s tense and when Schneider confronts her with what she already knows, her first reaction is to lash out. Machado did an amazing job in this scene. You can see how Penelope gets more and more wound up. As she pointed out, she’s a nurse so she knows somewhere that what Schneider saying is true. But she doesn’t want to face reality yet. Which is why she does her best to deflect everything he’s saying. Her body language really accentuates how Penelope is feeling. She keeps waving Schneider’s comments away. And eventually, she lashes out with some very hurtful comments. The minute Schneider leaves you can see that she regrets it. The guilt is all over her face and Machado does such a stunning job capturing Penelope's conflicting emotions. Penelope and Schneider have an unorthodox relationship but they’re always there for each other when it counts. So knowing that she pushed away one of her best friends, undoubtedly helped push her over the edge. And over the edge did she go. When thinking of a person with depression, something that comes to mind is that the subject will not find the will or motivation to leave their bed and face the traumas of living. A time-lapse sequence begins by first showing Penelope sleeping in, citing that she didn't set her alarm and does not feel well enough to go into work that day. Lydia's response is tantamount to how many people react if someone suggests that they could benefit from a "mental health day" home from work. Penelope's not physically ill so she could muster up the courage to go to work. Right? Well, no. And it's good to see Lydia quickly pick up on the fact that being mentally ill is just as viable of a reason to skip out on work as a physical illness. Machado's performance allowed the audience to organically follow along with Penelope's emotional spiral. Just because Lydia doesn't see it, does not mean that Penelope's not suffering. Even Lydia offering what looks to be one of Penelope's favorite breakfast foods isn't enough to keep her from wanting to bury herself under her covers forever. But the biggest bombshell? Penelope, sitting up in bed, staring at the fancy dress she purchased for herself back when she was feeling confident. It is known now that she is anything but, so her worry is understandable. It's too expensive, she regrets buying it. It's another common occurrence among people with these illnesses; serious regret for purchasing and perusing things you once loved doing. Penelope decides she does not want to go to dinner and meet Max's family. This is obviously a big thing for Penelope to miss out on, so it really must be something horrible happening to her, as Lydia comes to realize. Machado's acting here, in particular, is quite cogent. It truly feels like days and hours are going by and she is becoming significantly more broken at the seams. It's palpable, powerful. It's unlike most of what television has portrayed before when talking about this subject matter. It's everything and Machado truly delivers a poignant performance throughout the entire montage. The real meat of the episode is when Penelope decides to listen to Pam's advice and records herself at her lowest point. "Hello, Penelope, it's me, Penelope…this is so stupid." But it's not actually stupid at all. After all, it's what gets her out of bed. She goes off to Schneider's and asks him to listen to the recording with her to see how it sounds. You could cut the tension with a butter knife. Something is clearly not right with Penelope. She starts to break down and it's some sort of cathartic moment for Penelope at the moment where she agrees with Schneider that the woman in that recording is not her. She's worried she's failing her family. And it's when she says, "It's like when people tell me, ‘Be happy. You have a great life.' It makes me feel like garbage because I know. But what's wrong with me that I can't appreciate that? That I can't feel it? And what's the point of living if you can't feel anything?" where it truly hits her what a damaging and ravaging monster depression can be on the brain. Machado's emotions explode on the screen as Penelope is truly ruined from this. She recognizes how that could sound and she never wants to hit this place again. It's a moment that would bring anyone watching to tears. It's at this point, too, where Schneider opens up to her about his struggles with addiction wherein it's a full circle moment since he mentioned that he can sort of relate to her struggles. It's hard for Penelope to reconcile with the fact that she needs to be on a drug to function, and she will need it for the rest of her life. Machado shows the desperation Penelope has to get better, so well. You can see that it took a lot for her to even admit that something might be wrong. But she's not alone; she's nowhere near alone. A lot of research must have gone into writing this episode because it feels truly grounded in reality. Depression affects us all; if you don't have it, you probably know someone who does. It's messy. It can permanently ruin people. And yet, there is a light at the end of this seemingly bleak tunnel, or at least there can be. This episode and this scene show that medication can help certain people. It's hard to accept that it might have to be your new reality, but if Penelope can handle it, then anyone can. And that is truly inspirational. Machado was masterful in this scene and she handled this tough subject matter with ease and respect. This portrayal is unique in that it feels so real and Machado brings the realness to this scene extraordinarily well. Part of what makes One Day At A Time so striking is how many genres it hits, often within a single episode and occasionally at once. Rita Moreno's first appearance in Season One had an air of theatre to it, as does the Season Two finale. The comedy is rife, but it is punctuated largely by moments of gravity. That is one of two reasons the scene in which Penelope tells Lydia about going off her meds succeeds. The other? Machado, once again stealing the spotlight. This is probably one of the easiest scenes to watch in an episode where the mere idea of happiness feels fleeting, with the seemingly sole intention of reducing its viewers to a pool of tears in a curled-up ball on the floor. It says plenty, not about the focus of the show (which is rightly on Penelope here) but about the brilliance Machado brings that Moreno - EGOT winner Rita Moreno - plays second-fiddle. There is a clear point made throughout that this is a difficult topic, for two reasons. First, Penelope's Cuban background, a heritage that should mean she can deal with anything alone. The other is the obvious one: depression is uncomfortable to deal with. At the culmination of her absolute low here, Penelope's strength to admit the truth to her mother is utterly admirable. Machado captures that while keeping it apparent that she remains broken. There is raw emotion in her voice as first as she asks why Lydia is still awake - a question she most definitely knows the answer to - and then when she insists that she is not interested in hearing how her "Cuban brain should be able to fight off the crazy like a matador in a bullfight." It is the sort of triumph - if it can be called a triumph - that both viewers and Penelope need after a heavy character arc for her to overcome this feared aspect of her issues and for her mother to instantly accept it. This is a short scene, but one in which Machado shows her prowess. Only in the two solitary lines where her comments are humorous does she not ooze sadness and burden, seamlessly transitioning to the brief comedy before quickly, masterfully returning to conveying everything that Penelope is feeling. It is the mark of an incredible performance to surpass such a talented peer in quality; Machado does it with ease. The scene at the end between Max and Penelope was yet another prime example of powerful complex acting by Justina Machado. Throughout the episode, Machado portrayed every single possible emotion as Penelope struggled to cope with her depression and PTSD. She fought so hard to be strong and put up a tough exterior that gradually crumbled throughout the episode. Machado is a masterful acting powerhouse that can transition through varying emotions as easily as most people breathe. Without missing a beat, she can go from super excited to completely serious. She does it in a way that always feels organic to the character and the moment. She employed that powerful acting tool in this scene. It started off with Penelope trying to be super cute and happy to try and help cushion Max's expected anger but quickly transitioned to a very serious revelatory moment as it came time for her to confess. For the first time, Penelope felt ready to open up with him about her mental health. Machado took on this very solemn expression and there was a world of emotion boiling in her eyes and yet she held her voice strong with a bit of extra softness as Penelope powered through the confession. This is a character that likes to be seen as in control and at this moment, she had to let the man she loves see the side of her that was left traumatized by war. There was nervous energy to her performance, but that is what the character demanded at the moment. This was as much about accepting the truth herself as it was opening up to Max. As she is explaining things to Max tears build up in her eye, but through Machado's masterful acting the audience knows that's more a tear of release than of sadness. This was the perfect scene to conclude the episode as it showed Penelope's journey come full circle. Machado went on an emotional rollercoaster ride and it was a profound experience not just for her as an actress, but the audience as well. Her acting is so powerful it transcends the barrier of the screen and pulls the audience right into everything Penelope is experiencing. In terms of this episode, it was a cathartic and emotional journey she brought the audience along for. Her performance throughout was raw and indescribably powerful. She got to end the episode portraying this beautiful moment of acceptance. But, this show is technically a comedy, so of course, it ended with a laugh out loud moment. After Max revealed that he accepted her for every part of her there was this look of awe that Machado nailed so perfectly. It was as if she couldn't believe a man as perfect as Max existed and was hers. At that moment Machado's entire posture changed. She took Penelope from tense to at ease and relaxed and perhaps even a bit giddy. Not only had she come to accept her own truth, but she got to keep Max as well. This level of acceptance is something that is so very important to see portrayed in television. People who suffer from depression are often ostracized or dismissed without consideration or just flat out not understood. This portrayal of pure unquestioning acceptance was beautifully done and the look of awe and love that Machado portrayed in that moment was stunning. That moment of pure heartfelt acceptance led Penelope to lovingly move to lovingly kiss him. The kissing started off as soft and genuine then transitioned over to what two teenagers in a dark movie theater do. It was meant to play for laughs and that it definitely did. Keep in mind, just moments earlier she was open and emotionally raw to this man and now they were making out like teenagers. Throughout the scene, Machado not only ebbed and flowed the emotions, but her body language as a whole went through some impressive shifts. This entire episode was a tour de force for her and this scene was a perfect encapsulation of all of it. Even when describing each scene of this episode in painstaking, accurate detail, it's simply not enough to prove how remarkable Justina Machado really was in this offering. You could swear Penelope Alvarez was a real person actually suffering from depression and trying to navigate in a world where the stigma is heightened for people like her. It's a brutal cycle that Penelope worked tirelessly to halt, and it was inspiring watching her triumph through it. It's not easy for anyone to pull off a feat such as this, let alone doing such with grace and veracity. Machado proves that, when given the opportunity to sink your teeth into a character with mental illnesses, it's not difficult to give the role the dignity it requires. "Hello, Penelope" is the perfect showcase of the best and worst of Penelope and the very best of Justina Machado. Hopefully, the show will be renewed for a third season and fans can watch Machado bring Penelope to life even more next year. Hello, Penelope had many brilliant moments from Justina Machado, so many that they couldn't all fit into this one article. Please use the comments to discuss all the scenes that weren't covered here.